November is National Healthy Skin Month. The American Academy of Dermatology (AAD) first implemented November as healthy skin month in order to raise awareness about the importance of keeping skin fresh, hydrated and healthy all year round. So in honor of the month, here are a few tips that will help you maintain healthy skin all year long and not just in November! Lets start with the an easy one. Sunscreen, of course! When selecting the right sunscreen here are a few things to look for. Making sure its a broad spectrum SPF, that will help protect from UVA and UVB rays. Always select an appropriate sunscreen for your skin type (normal, dry or oily) not all sunscreens are the same some can be irritating or even cause breakouts. And remember to reapply every 2 hours, if you wear makeup the Elta MD UV Clear in Tinted blends good with makeup since the shade is tinted and is extremely lightweight. Proper cleansing and use of moisturizer. Making sure that you are using the right cleanser for manual cleansing includes selecting the right type: cream, gel, exfoliating can make your wash go from mediocre to leaving your skin with a morning glow. For those that use a Clarisonic Facial Brush, remember when using these brushes the heads must be changed every 3 months, after a while the brush will feel worn out and its a hygienic thing. Sleeping in makeup? Say no more! Makeup can be applied and removed as you please, but if you forget to remove it at the end of the night, you might just pay for it the next morning. Makeup that’s left on overnight can result in acne, clogged pores, and even premature aging. So if you do happen to fall asleep with your makeup on, just know that you’re depriving your skin of some serious quality time to heal its self and prepare for the next day. Great skin happens by appointments. 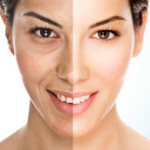 Scheduling your monthly facials and microderms will transform your skin. It will give your skin a rejuvenated glow. Also remember microdermabrasion gently sands the superficial layers of your skin, so your makeup will look beautifully smooth. Your Environment. Stress is a huge contributor to skin problems like acne and wrinkles. Making time to relax during your hectic days can greatly improve the condition of your skin. For skin care product recommendations or to schedule a complimentary consultation call us at 913-685-1108.